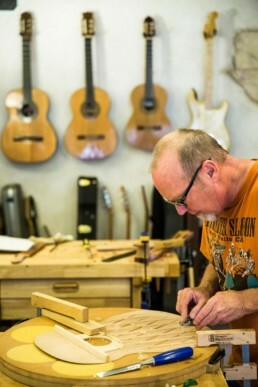 Waylin Carpenter Guitars started in 2000 with a happy accident. The result of some inspiration and free time: Guitar Number One. It has since grown into a complete custom Classical Guitar shop, producing quality guitars for the best players in the region. Waylin began what would be a life-long music career with a $9.95 Silvertone given to him on Christmas in the 3rd grade. Other than some Hillbilly licks learned from his Grandpa Jones, Waylin was a self-taught musician. In seventh grade he built his first fuzz box. In ninth grade wood-shop it was an SG body for his Teisco Del Rey. In sophomore year electronics he was hot-rodding tube amps, and built his first complete amp in senior year. He studied music theory and Jazz at Yuba City High and Yuba College, and by his early 20s had become a full-time musician. He played in many notable bands in Northern California including Steel Breeze, who earned a record deal with RCA Records in 1982 and produced several hits. Fast forward to 1993 and end the Rock and Roll days, when his daughter Brieta was born. He picked up the Classical Guitar again, having dabbled in his college days. 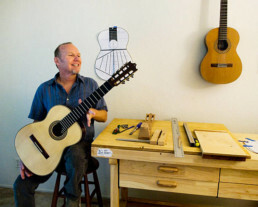 After owning an unplayable Ramirez 1A, and later an upgrade in a Khono Pofessional R, he decided to channel his craftsmanship into building a Classical Guitar of his own. He crafted the guitar from Fleta plans, completing it in year 2000. It turned out to be a happy accident as it sounded and played fantastically. Thus, launching Waylin’s career as a luthier. Somewhere along the way, Waylin presented his guitars to Matthew Grasso, a renowned Classical Guitarist from Davis, California. Matt helped tremendously in Waylin’s quest to create high quality instruments for today’s classical guitarists. At this time, Matt was taking interest in extended seven-strings and was playing Gregory Beyer’s guitars, which are considered the gold-standard of classical guitars. In the beginning of this relationship, Waylin found himself building seven-strings for Matt’s students. 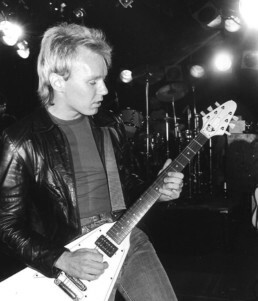 Eventually his guitars reached a certain level of quality, and Matt began commissioning guitars from Waylin for himself. Through the years following, Waylin would produce guitars for many eager musicians with all sorts of unique customizations, from odd body shapes to guitars with 15 strings, approaching each with care and inventiveness. Now, in 2018, Waylin’s instruments are known for their loud and deep basses, their sweet yet strong trebles, their versatility, their playability, and their modern yet beautiful aesthetics. Attention to detail, comprehension of the musician’s wants, and an absolute love for the craft are what make Waylin Carpenter Guitars the incredible instruments that they are.